I cannot stress this enough and you may have found me repeating this over and over in the last few posts – it is that important – and I will probably keep on repeating it in the future till you get it in your head. Learn how to manage your time well..
* Start off by making a list of the things you need to do – here, what all subjects and chapters you need to study/practice/revise. * Take another piece of paper and start listing the things in decreasing order of priority, i.e. do the important things first and leave the easy ones for last. What do you need to finish off first? What have you been skipping or leaving out up until now, thinking that you will do it later? Do that chapter first – today. * Do NOT procrastinate. Need I say more? * Look at the time and set a schedule to start studying the main things first. 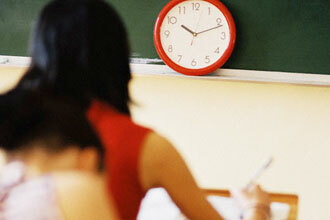 While making your time-table, keep about 40 minutes for studying and a 5 minutes break after every 40 minutes. If you can stretch the time to one hour, then take a 7 minute break afterwards. Do not keep on studying if you feel bored or are itching to take a break. In such a case, walk around for 2 minutes, drink a glass of water or get yourself a snack, breathe in fresh air, and go back to studying. However, this should not be so frequent that you barely get any studying done. * Make a realistic schedule. We are not asking you to finish the whole syllabus of a subject in one day straight. Neither are we asking you to study for 15 hours at a go. We definitely do not want you to stress yourself out just because you cannot keep up with your time-table that you have made by yourself. Make a time-table that you know is challenging yet not impossible – something that will keep you on your toes and which you won’t take lightly. * Never, ever, ever delay things on your time-table. Stick to your time-table and make sure you work smartly, so that the most number of things are finished in the most effective way. Do not rush through studying just so you can check off that particular chapter from your list. Study in such a way that you remember what you study, and do not forget it after 5 minutes of having read the same content. It is all right if you lag behind your schedule by 30 minutes or so, but more than that means that something is wrong. Either you have unrealistic expectations or you have been wasting time. 7:15 – 8:00 Study English I prepositions,verbs, active/passive, direct/indirect, vocabulary, read essays, etc. You can always take the help of the above time-table and adjust it according to your preferences. Hope this helped and we wish you make smarter decisions in the future regarding what you are giving your time to – here’s to a more efficient you! No, cursive handwriting is not compulsory. Just ensure that your handwriting is neat and legible. You can access the timetable from our “Design Your Time Table” page in our top Menu bar. Let us know if you have further questions. Keep visiting! Please visit our “Design Your Time Table” page in the top menu bar. You can divide the time from 3:30pm – 6pm, which has been allocated for tuition classes, to two subjects of your choice (preferably to which you feel you should devote more time). In addition, five other subjects have been covered in the time till 10:30pm. The dinner time can be extended from 8:30pm to 9pm for your convenience. Hope this helps! If you have further questions, please do not hesitate to ask. Thanks for stopping by!